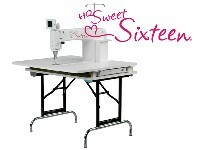 Handi Quilter Sweet Sixteen sit down model. Shipping and tax apply depending on where product is shipped. Special package pricing available.